LONG ISLAND, N.Y.—Brains & Behavior,* a conference at Cold Spring Harbor Laboratory (CSHL) held from May 30 to June 4—furnished a captivating look at the work of neuroscientists toiling to isolate the multitude of missing links that bind B&B. Of course, everyone knows about the close ties between the two, but generation after generation of researchers will be needed to figure out the how of it all. At the end of the conference, Adam Kepecs, a CSHL researcher who had given a talk about his lab’s work on how the brain computes confidence in its own decision-making, summarized several emerging themes to be derived from the conference—novel technologies driving progress in the field and the conversion of some basic research into treatments—not just pharmaceuticals but technologies such as electrical stimulation of the brain. The still relatively slow pace toward clinical trials follows from the size of the challenge. “Understanding the brain functionally—and its dysfunctions—is arguably one of the greatest challenges of humanity,” Kepecs said. CSHL asked me to interview three of the presenters for the lab’s YouTube channel, CSHL Leading Strand. The videos, just a few of those from the conference on the lab’s channel, provide more detail about what the scientists there are up to—and the halting steps toward that initial base camp. There was Li-Huei Tsai of Massachusetts Institute of Technology’s Picower Institute for Learning and Memory who talked to me about using noninvasive, flickering light that alters brain rhythms to potentially aid Alzheimer’s patients. Ricardo Dolmetsch, global head of neuroscience with the Novartis Institutes for Biomedical Research, recounted the development of a gene therapy for spinal muscular atrophy. And Robert Malenka, a professor of psychiatry at Stanford University Medical School continues to investigate a brain pathway that promotes social interactions—as well as the street drug, MDMA (aka ecstasy), which enhances prosocial behavior, also through its actions on the neurotransmitter serotonin. The path forward still twists ahead into the distance. I talked to David Anderson, a professor of biology at California Institute of Technology, whose presentation was on the neural effects of social isolation. He paraphrased for me a quote that he had made in a new documentary on brain science that was shown at the conference. The quote itself was a plea for humility: The field of neuroscience, he said, is like a bunch of ants at the bottom of Mount Everest. They have yet to arrive at Base Camp 1 and, so far, it’s impossible to see how high the mountain is. To get to the summit, good people are going to be needed to do the work. At the end of one talk, Tony Zador of CSHL, another presenter who works on mapping neural circuits using DNA, put up a GIF of the 100 people or so who belong to the lab’s neuroscience program. The next frame eliminated all the team members who do not hold a U.S. passport, more than half the group. The shrinkage continued in the next shot, showing only those born in the U.S. In the final frame, it became still sparser, condensing to the few whose parents were born here—a cautionary argument about what could happen to U.S. science if the political frenzy to restrict immigration persists. 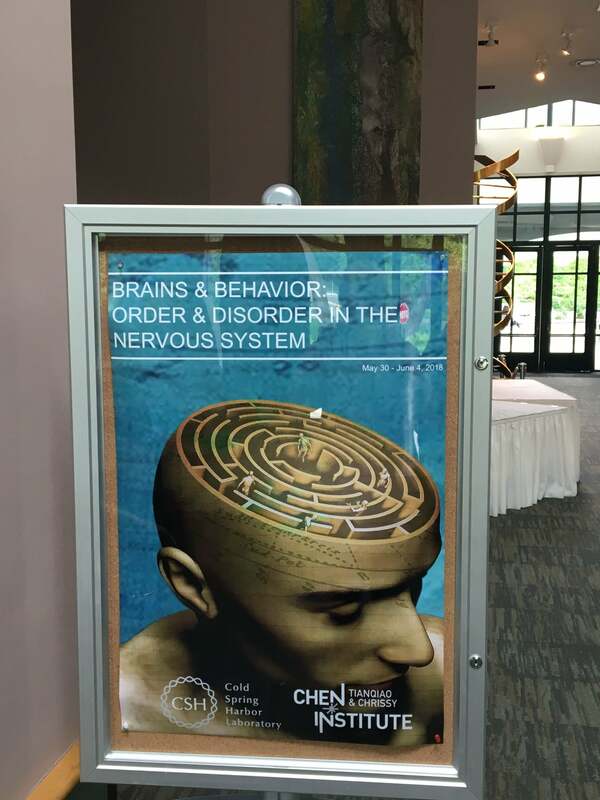 *The formal conference title was the 83rd Cold Spring Harbor Symposium on Quantitative Biology—Brains & Behavior: Order & Disorder in the Nervous System.